As part of its policy of transferring know-how to the industry, EDHEC-Risk Institute has set up Scientific Beta. Scientific Beta is an original initiative which aims to favour the adoption of the latest advances in smart beta design and implementation by the whole investment industry. Its academic origin provides the foundation for its strategy: offer, in the best economic conditions possible, the smart beta solutions that are most proven scientifically with full transparency of both the methods and the associated risks. Within the framework of smart beta offerings, Scientific Beta provides access to smart factor indices, which give exposure to risk factors that are well rewarded over the long term while at the same time diversifying away unrewarded specific risks. By combining these smart factor indices, one can design very high performance passive investment solutions. Felix Goltz, Research Director, Scientific Beta. Factor investing offers a big promise. By identifying the persistent drivers of long-term returns in their portfolios, investors can understand which risks they are exposed to, and make explicit choices about those exposures. In a new white paper entitled “Measuring Factor Exposure Better to Manage Factor Allocation Better: A Critical Approach to Popular Factor Box Initiatives,” Scientific Beta presents a critical approach to popular factor box initiatives through two contributions questioning the choice of factor menu and factor proxies and the way in which the measurement of the latter is implemented. Additionally, we may question the way in which the measurement of factor proxies is implemented. Most popular factor analysis tools used by investors deviate from the models used in research because they choose to use factor scores instead of betas. An additional problem is that the one-dimensional nature of factor scores does not take into account correlations across different factors. This leads to the double counting of the exposures of factors that are highly correlated. Lastly, many popular factor scores combine variables into composite factor scores. Combining factor scores into composite scores makes the mismeasurement problems worse as composites from skewed score distributions may be biased towards one of the variables. 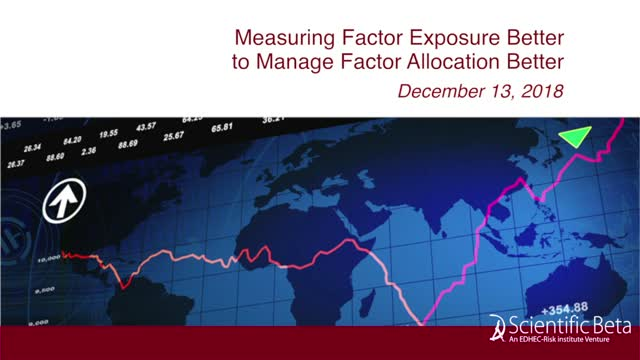 This webinar will review these issues of factor risk measurement and will show how these can be countered. What is the best way to construct multi-factor indices? - Considering cross-sectional negatives of single factor indices, seeking maximum exposure to rewarded factors, portfolio concentration versus diversification; what are the issues behind the bottom-up versus top-down debate? - From alpha to beta to stock picking: do stock factor champions exist? - What are the limits of bottom-up approaches? - Can we reconcile the top-down approach and consideration of cross-sectional negatives of single smart factor indices combinations? - What method can be used to maximise the benefits of factor investing? In this webinar, we are going to present new research on how to harvest factor premia without suffering from market volatility. This integrated approach breaks with the traditional practices of L/S factor investing, which are often based on poor risk management practices. It also enables investors to leverage the performance offered by this kind of strategy in the most efficient way possible. - The limitations of traditional L/S approaches in smart beta and factor investing. - Robust market estimation of beta and improvement of the market neutrality of L/S strategies. - Risk management as a source of performance. - What are the bias and unrewarded and undocumented risk exposures that can affect the performance of smart beta and factor benchmarks? - How to evaluate and communicate on the risks of smart beta policy benchmark with respect to the different stakeholders?